The Worm Ouroboros, E. R. Eddison. New York: Open Road Media, 2014 (originally published 1922). Summary: A heroic fantasy of the warfare between Witchland and Demonland, including the quest to rescue Goldry Bluszco, after he is banished by spell to a remote mountain top in revenge for defeating and killing King Gorice XI of the Witches in a wrestling match. This is a work of heroic fantasy that was praised by the likes of J. R. R. Tolkien, C. S. Lewis, and Ursula LeGuin as inspiration for their own work. And certainly the ideas of transport to an alien world, heroic quests, and great, and often seemingly hopeless, contests against evil powers find their roots in this work. I came across this work first around the time I discovered The Lord of the Rings and saw Tolkien’s commendation. I never picked it up until recently, perhaps because of the obscurity of the title. Ouroboros refers to the worm (a term often used for dragons or serpents) who swallow their own tail, forming an endless ring. It is a symbol worn by the king of Witchland, and the idea of an endless cycle figures in the conclusion of the work, which I will not give away for those who haven’t read it. The story is told through the eyes of one “Lessingham” who is transported from Earth to Mercury, where this story takes place. After the early chapters, Lessingham disappears from the story, not to reappear at the conclusion. The story really begins with brothers Juss, Spitfire, and Goldry Bluszco, and Brandoch Daha, the Lords of Demonland receiving the diminutive ambassador of Witchland who asserts the Kingship of Gorice XI, King of Witchland over Demonland. The Lords of Demonland decide to contest this via a wrestling match between Gorice, famed for his wrestling prowess, and Goldry, a formidable wrestler in his own right. If Goldry wins, they submit; if not, they retain their independence. Goldry defeats and kills Gorice XI, and in vengence, his son casts a spell that transports and imprisons Goldry on a distant icy mountain top. Juss and Brandoch think he is being held in Carce, the capitol of Witchland, and only learn in defeat and escape through an ally, of the spell that has sent him far away. This sets up the remainder of the book, divided between the quest to rescue Goldry, and the wars against Witchland. Juss and Brandoch Daha pursue a year-long quest, including a battle against a terrifying manticore taking them to the mountain castle of Queen Sophonisba, who tells them Goldry can only be reached by finding the egg of a hippogriff, back in Demonland. Meanwhile, Spitfire unsuccessfully resists an attack by Duke Corsus on Witchland. He takes the castle, Krothering, of Brandoch Daha, and lays it waste. Brandoch’s sister escapes when Gro, a spurned adviser of Corsus turns traitor and helps her get free. Ultimately, Gro will turn traitor once more. Juss and Brandoch return in time to expel Corsus and the forces of Witchland, then Juss finds the hippogriff egg, rescues Goldry, leading, after defeat of the fleet of Witchland, to the climactic battle before the gates of Carce. The book is not an easy read. The language is influenced by Elizabethan English (an odd choice for events taking place on Mercury), including written texts in period English (which sometimes look like the writing of someone who is spelling challenged–which may help in deciphering it). Some may contend that this is far simpler than Tolkien’s passages in Elvish, the languages of Dwarves, Orcs, and the Dark Tower. Some might complain about all the different names and kingdoms (in addition to Witchland and Demonland, there are Ghouls, Goblins, Imps and Pixies!). Eddison helps us somewhat with a chronology summarizing the relations of all of these at the end of the work. What I struggled with, and perhaps it is an artifact of the heroic fantasy genre, is that I do not see any of the characters grow through the quests and battles they face. Courage and heroism there is in abundance, as is deceit, betrayal, and dark arts. But in the end, the horrors and travails of war, and the conquest of evil do not seem to eventuate in the love of peace or the wise pursuit of a better world. The main characters only seem to be defined by the quests and battles, perhaps an earlier version of Klingons who think it a shame to die a peaceful death. On the one hand, it raises the question of whether tension, or some threat, is necessary to out the best in human beings, or whatever human-like races these beings are. And yet, these figures cannot envision quests that don’t involve killing or dying or battle. Is there not also a heroism that heals, that pursues peace, goodness, truth, and beauty–sometimes in the resistance of evil and deceit and ugliness–but also in the creation of cultural goods? As influential as this story was, what I saw in Tolkien that I miss in Eddison is a richer heroism, one capable of growth, that fights evil when it must but loves hearth, home, song, and good food, and a world where these might flourish. J. R. R. Tolkien: A Biography, Humphrey Carpenter. New York: Houghton Mifflin, 2014 (originally published 1977). Summary: The biography of the author of The Hobbit and The Lord of the Rings, describing his early life, participation in The Inklings, and his habits of work, scholarship, and how his most famous works came to be written. Central to Carpenter’s narrative of Tolkien’s life is his preoccupation with the mythology most fully expressed in his posthumous Silmarillion but also in his earlier “elvish” poetry, The Hobbit, and in the work for which he was most know, The Lord of the Rings. Carpenter sketches the backdrop to this mythology in a life that included the loss of both parents at an early age, the influence of Father Francis, the formation of T.C.B.S. (Tea Club, Barrovian Society, the pre-cursor to the Inklings), his romance and eventual marriage to Edith, his war experiences, his scholarly life as a philologist at Oxford, and his involvement with the Inklings and relationship with C. S. Lewis. I was surprised that Carpenter did not make more of the influence Tolkien’s war experience on his writing, as some recent writers including Joseph Loconte and Colin Duriez have done. [See my reviews of A Hobbit, A Wardrobe, and a Great War and Bedeviled]. I wonder if for Carpenter, he would have traced more of the influence in Tolkien’s books to the mythologies of Iceland, Beowulf, to Arthurian legend, and Sir Gawain and the Green Knight. We learn of some of the childhood places, reminiscent of his descriptions of The Shire. We see his love of fairy stories and eventually Icelandic myths. And during his convalescence from the war, we see his first musings on a mythology that would occupy his life. Carpenter describes the beginnings of The Hobbit in stories told to his children, unconnected at first to the rest of the developing mythology, and the important role his publisher’s son had in persuading him to publish this story. Then there is the pressure for “more Hobbit stories” that leads to the beginning of the writing of The Lord of the Rings, which would occupy twelve years. We learn that Tolkien really hadn’t connected it to his larger mythology until Frodo and the Ring arrive at Rivendell. Carpenter recounts the back and forth with his publisher over publishing The Silmarillion concurrently, and the endless revising and development of backgrounds, history, and language that would occupy Tolkien for the rest of his life. I think this is an essential biography for an Inklings fan, arising out of acquaintance with Tolkien, friendship with his family, and a sympathetic appreciation of the genius that created Middle-earth and the flat sides that come with such genius. He portrays a man who lived in hobbit-like modesty enjoying the pleasures of home and a good pipe, yet caught up in a truly great story in which he played a most significant part. Bedeviled, Colin Duriez. Downers Grove: InterVarsity Press, 2015. Summary: An exploration of the conflict of good and evil in the works of C.S. Lewis and J.R.R. Tolkien, and how two World Wars influenced their thinking. This is the second of two books that look at the intersection of war experience and the works of Lewis and Tolkien. The difference, I would say, between Joseph Loconte’s A Hobbit, A Wardrobe, and a Great War (reviewed here) and this book is that in Loconte’s book, war is foregrounded to a greater degree; in Duriez’s book, the nature of evil, the evil powers, and the conflict with the good running through their works. Hitler’s emotive speech may have still tugged at Lewis’s mind in the quietness of his church that Sunday. England faced the very real danger of invasion by Hitler’s forces, driven and maintained like a machine….During the church liturgy and bad hymns (as Lewis regarded them) he found his thoughts turning to the master of evil, Satan. Somehow, the arrogant dictator resembled him—not least in the size of his ego and self-centeredness. In the jumble of thoughts jostling with words of a great tradition, it struck Lewis that a war-orientated bureaucracy was a more appropriate image of hell for people ignorant of the past than a traditional one. Here was Hitler bent on taking over and ruling European countries, including England. There was the devil, who had designs to exert his will systematically over all parts of human life, his ultimate aim being dehumanization—the “abolition of man,” as Lewis later called it.” (pp. 21-22). Duriez proceeds to show how the “war-oriented bureaucracy” that aim to dehumanize was at the heart of Lewis’s portrayal of hell and the work of the tempters in The Screwtape Letters. Chapter 3 then shows how much of the work of Lewis and Tolkien during the Second World War focused around devilry, from the decision of Tolkien to begin writing The Lord of the Rings (a new Hobbit book) to Lewis’s publication of The Problem of Pain, The Abolition of Man, The Great Divorce, and the Space Trilogy. In addition, there were the BBC broadcasts that formed the core of Mere Christianity, in which Lewis argues for our sense of right and wrong as basic to our search for meaning, and from this to a Christian understanding of God and his work in Christ. In fiction, he explores the same themes in the Space Trilogy as Ransom understands the nature of our fallen planet in Out of the Silent Planet, fights evil in the character of Weston in Edenic Perelandra, and faces the banal but de-humanizing character of evil, so present in Hitlers prison camps, in That Hideous Strength, where technology is de-coupled from human values. While the first part of the book explores the problem of evil, particularly laid bare by war, the latter part of the book focuses more on the intersection of good and evil, exploring progress and regress in Lewis’s Pilgrim’s Regress, the divide between good and evil in Tolkien’s “Leaf, by Niggle” and Lewis’s The Great Divorce, the power for change, whether good or ill, portrayed throughout the Chronicles of Narnia, and the experiences we have of pain and love in A Grief Observed, The Four Loves, and Till We Have Faces (this last exploring the evil of loving inordinately and possessively, and the hope even here, for redemption). The final two chapters consider how we become free of the tyranny of self to become who we are truly, and the images of future hope in both Lewis’s and Tolkien’s writing. The book then concludes with two appendices which return to themes explored throughout the book: “War in Heaven” being concerned with devilry, and “The Spirit of the Age” with subjectivism, the detaching of morality from any transcendent sense of meaning, anticipating both scientism and our post-modern turn. I found Duriez’s exploration of the forms evil can take in modern society chilling–the machine, the soulless bureaucracy, the big lie that they state can make us safe, secure, and usher in a new order of greatness. Against this is the challenge of goodness, that makes no dramatic or inordinate claims, that recognizes that the small choices matter the most and may lead us “imperceptibly toward good or evil, heaven or hell” (p. 145). We see in Lewis and Tolkien, the heroism of the ordinary person, with no pretensions, acting in faith and trusting obedience in the face of threatening evil, and the final victory of the good. They wrote to encourage those facing the great conflict of World War II, and in their words, we might also find the kind of bracing comfort we need to face the challenges of our own day. A Hobbit, a Wardrobe, and a Great War, Joseph Loconte. Nashville: Thomas Nelson, 2015. Summary: A study of why Lewis and Tolkien, contrary to a disillusioned post-war generation, went deeper into their faith and allowed both war experience and that faith to shape their greatest works. For Loconte then, the beginning point is to discuss the “Myth of Progress” that preceded the war as it viewed humans, society, and technology evolving to ever more enlightened forms by which humanity would cast off the darkness of ignorance that had contributed to so much suffering in the past. With the onset of the war and the horrors of the trench warfare (perhaps Tolkien’s inspiration for his vision of Mordor), these illusions were shattered for many. Both were casualties of war through illness or wounds. In Lewis’ case, a journey through the country to a hospital to convalesce may have sparked a vision of Narnia. It was during Lewis’s war years that he came across George McDonald’s Phantastes, that certainly contributed to the conversion of his imagination. War’s end brought the massive disillusionment of much of the intellectual class. While Tolkien devoted himself to work and to his Catholic faith, and began to sketch the outlines of the great myth that would be the foundation of Lord of the Rings, Lewis struggled with doubt. 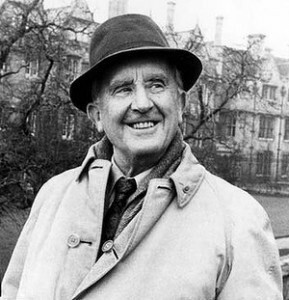 Lewis and Tolkien first met in 1926, recognizing their common interest in languages. But they had a profound disagreement about myth that culminated in a long conversation between Lewis, Tolkien, and Hugo Dyson in which Lewis recognized the story of Christ dying and rising to be a true myth, a crucial step for Lewis in coming to Christian faith. In the years ahead, they would collaborate as two key figures in a larger group knowing as the Inklings in a host of writing projects that birthed the Space Trilogy, the Chronicles of Narnia, and The Lord of the Rings, as well as many of Lewis’s apologetic works. Through the mutual encouragement they gave each other and their vibrant faith, they provide a counter for the outpouring of disillusioned, despairing writing of the post-war period. What is more, they envisioned in their work, shaped by their experience of a brutally efficient technology unhinged from a larger theological framework, the ways bureaucracy and technology might interweave to obliterate the human image in books like That Hideous Strength, or in the idea of a Ring of Power that could subject all manner of beings to its owner’s bidding. Seeing the machines of war in their own experience, and the more sinister regimes of Hitler and Stalin, they could write of the evil power that, as Screwtape desires, would devour the other. Yet Loconte shows how this bracing grasp of the nature of evil did not discourage them. Their works were infused with Christian hope–an Aslan that rises, a hobbit who, against all hopes, fulfills his mission with the help of tragic Gollum, the crowning of Aragorn as the long-awaited great king, and the Christ-like figure of Ransom, who summons both Merlin and the angels to subvert the villainies of the N.I.C.E. Like the foot soldiers in the war, many of the most significant turns of events come from the actions of children and hobbits doing their duty. This, as I said, is not a book that covers new ground, but I found myself as I read making new connections, the “I hadn’t thought of it that way” moments when you see something you know in a new way. Loconte concludes the book with a tribute to grandfather, Michele Loconte, who fought with the American forces, and only after the war became a U.S. citizen. Loconte says his research helped him understand more how the war had an impact on so many ordinary families including his own. Fitting that an Inklings scholar should make this connection between his own history and that of the Inklings! The Fellowship, Philip Zaleski and Carol Zaleski. New York: Farrar, Strauss, and Giroux, 2015. Summary: This traces the literary lives of the four principle Inklings (Lewis, Tolkien, Barfield, and Williams) the literary club they formed and its impact on literature, faith, and culture. This is a magnificent book for any Inklings lover! It serves at one and the same time as a quadruple biography of the four principle Inklings and traces the formation, life and impact of this literary gathering of scholars (all men) and their wider impact on many others, including women like Dorothy L. Sayers. As biography, it brings to life these four figures as well as biographies I’ve read on any individual Inkling. Lewis has been written on the most, and yet I thought the Zaleskis teased out more about his relationship with Warnie (who submerged his own career to a certain degree for that of his brother, and who in turn was cared for by Lewis as he struggled with alcoholism), as well as Lewis’s relationship with Mrs. Moore. We see Tolkien as a deeply devout Catholic often concerned over the spiritual lives of his sons, and his lifelong struggle to bring forth the tale of Middle Earth. We learn of Owen Barfield’s obsession with anthroposophy, and the often affectionate, sometimes not relationship with Lewis as his most significant sparring partner (he later, for a time, had an influence on the American writer, Saul Bellow). And last, we learn of the mystical romantic Charles Williams, the Oxford University Press editor who wrote “supernatural shockers” and had “interesting” though chaste relationships with a number of women attracted to his romantic vision, and whose early death in 1945 was deeply grieved by Lewis. We also learn of the formation and inner life of this all-male discussion group. Serious discussions occurred on Thursday evenings, usually in Lewis’s rooms in Oxford. Often these consisted of the reading and critique of works in progress. It was here that Barfield’s works on language, Lewis’s Space Trilogy and Tolkien’s Hobbit and Fellowship of the Ring first made the light of day. If it weren’t for the encouragement of this group, as well as Tolkien’s publisher, this latter work may never have been published during Tolkien’s lifetime. More informal conversations took place on Tuesday mornings at the Eagle and Child (the “Bird and Baby” as it was known) and was marked by rollicking male laughter and repartee. It was also fascinating to see the critical role Williams, one of the later to join, had on the vitality of this group. When he died, something died among them as well and the gatherings began to dwindle. We also have briefer portraits of other Inkling members: theatrical producer and Chaucer scholar Nevill Coghill, biographer Lord David Cecil, poet and scholar Adam Fox, the classicist Colin Hardie, and the scholar, who along with Tolkien labored for Lewis’s return to Christian faith, Hugo Dyson. There are others as well, like novelist John Wain, and those not in the circle, but who contributed and were inspired as well, like Dorothy L. Sayers and Sister Penelope Lawson. The Zaleskis also explore key episodes in the lives of these different figures. Perhaps most striking was Lewis’s debate with Elizabeth Anscombe. The Zaleskis are more nuanced than some, seeing this both as a serious challenge to Lewis’s ideas on Miracles (he later re-wrote portions in response) and yet not as the utterly devastating setback to his apologetics that turned him to writing children’s stories. They observe that he continued to publish numerous articles on apologetic themes and that the greater concern for Lewis was the effect of apologetic argument on the soul of the apologist. What was most significant to me was the tale of how this informal gathering sparked literary scholarship, literature in a variety of genre, and for Lewis to a greater extent, and others to a lesser, a Christian intellectual presence at Oxford. This did not so much seem by design, but rather the recognition of these men in each other a vision for such things that they fueled and refined through their weekly discussions. I think of other such groups, like the “Clapham Sect” who gathered around William Wilberforce and brought about both religious renewal and social reforms including the abolition of slavery in early nineteenth century England. What particularly marked the Inklings, it seems to me, was a combination of intellectual rigor and personal affection (sometimes tried and tested) that contributed both significant scholarly work (such as Lewis’s preface to Paradise Lost, or Barfield’s work on language and poetic diction) and works of great popular impact. This is a book to be savored both by Inklings lovers and a newer generation that may wonder about the world that gave us the likes of Lewis and Tolkien. It is sympathetic without indulging in hagiography. It is real about the shortcomings of the principle Inklings without descending into a hatchet job on their lives. In it we see mere humans (and some mere Christians) whose fellowship birthed an ethos and enduring works that have touched the lives of many. I hate not finishing things! I rarely leave a book unfinished. I don’t like to leave food on the plate. And I like to finish a job that I start. Yet one of the things I’ve become increasingly conscious of as I get older is that some of the things I’ve dreamed of–whether my dreams for campus work, for our organization, or for the impact of Christian thought in the part of the world where I live–I will likely live to see only glimmers of the things I’ve dreamed of. Until the end of history and the return of Jesus, the day comes for each of us where we lay down our work, and ultimately our life in this world–always with things undone, always with more that we know could be done. I think of great “unfinished” works of music. There are Schubert’s Eighth Symphony, Mahler’s Tenth Symphony, and Edward Elgar’s Third. What must it have been like for those composers to have music in mind that was never realized on a score? 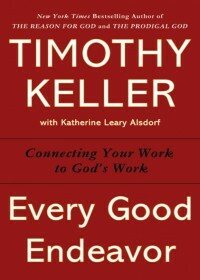 I’ve just begun reading Tim Keller’s Every Good Endeavor. In one of the early chapters he recounts the little story J.R.R. Tolkien wrote, Leaf by Niggle that tells the story of an artist, Niggle, who has a vision of a scene with a beautiful tree in the center. Try as he might, Niggle can never capture the whole tree, only one very perfect leaf. Then Niggle goes on the long journey of death until he comes to a place where he sees the tree of his vision and realizes that his creation was part of a much larger Creation of a greater Creator. Keller notes that this story was written at a time when Tolkien doubted that he would ever complete Lord of the Rings, and that Tolkien was in fact Niggle! Keller draws from this the idea that for the Christian, in the words of 1 Corinthians 15:58, “Therefore, my dear brothers and sisters, stand firm. Let nothing move you. Always give yourselves fully to the work of the Lord, because you know that your labor in the Lord is not in vain.” (NIV) Paul’s hope was not that our work would be complete in this life, but that there would be a resurrection to a new creation, where somehow our creations would carry over into the final Creation. In the past, I’ve thought of reading aloud as primarily something I did when my son was young, something my wife and I do occasionally on long trips, or something done on audiobooks–which I have rarely listened to. I do have wonderful memories of books read aloud, particularly ones where it seems the author wrote with the view of his or her work being read aloud. I think here of Tolkien, particularly some of his songs and poems, or Jane Yolen’s Owl Moon, one of our favorite children’s stories, or the marvelous Winnie the Pooh stories that I was introduced to at InterVarsity’s Cedar Campus retreat center by Keith Hunt, its first director. “Pooh readings” were a tradition for many of our ‘camps’–as much loved by students and adults as the little children among us! What are your experiences of reading aloud? Do you have books you would especially recommend that are good to read aloud? And do you ever read aloud to yourself?